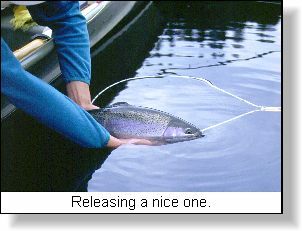 Flyfishing in lakes would be a lot easier if trout only fed on food items floating high on the surface film as this would require only a floating fly line to present our imitations. Unfortunately, the majority of trout feeding occurs subsurface and at times in water greater than 8 metres deep. This means having a selection of sinking fly lines as well as the floating line to effectively have a closer look at the basic fly lines that should be in every stillwater anglers tackle bag. Floating lines are actually quite versatile in that you can use them for presenting dry flies as well as fishing nymphs or insect larvae from just sub surface to deep in the water column. The limiting factors on how deep you can fish with the floating line is leader length and the angler's patience to wait for the fly pattern to sink to the desired fishing depth. 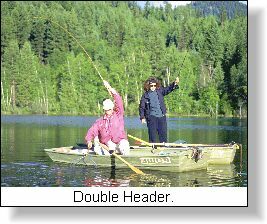 In reality, floating lines are effective when fishing water to about 5 to 6 metres deep with leaders as long as 7 metres in length. Most anglers will find leaders longer than that extremely difficult to cast. Look at the floating lines as a 30 metre long bobber and by varying the length of leader used you can effectively cover the shallow shoal or littoral area of a lake which is where the majority of trout feeding occurs. Floating lines are a good choice when fishing chironomid larvae and pupae, mayfly nymphs, damselfly nymphs, caddis pupae and of course the adult forms of these insects. Using weighted fly patterns further expands the effectiveness of the floating line. I always carry 2 reels set up with floating lines. One line has a longer leader of 5 to 6 metres in length and the other with a shorter 3 to 4 metre long leader. Regardless of leader length used to make sure it is tapered so that the fly will turn over on completion of the cast. This fly line sinks at a rate of between 1 and 2 inches/second. This slowest sink rate gives you the ability to retrieve a fly in a very precise or narrow depth range which can be critical when fishing chironomid pupa, emerging mayfly nymphs, migrating damselfly nymphs and emerging caddis pupae. As with any sinking fly line the longer you wait the deeper the line will sink, but again, this line has the slowest sink rate and thus is an excellent line for water less than 6 metres deep. 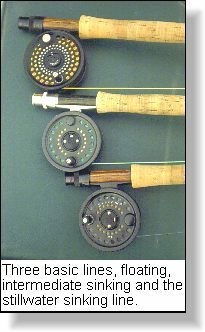 Use of these lines reduces the amount of time you have to wait for flies to sink which for beginning flyfishers is important as the skill of learning to be patient has not been fully developed. Leaders from 3 to 4 metres long work well with this slow sinking line. Another excellent sinking line is the "Stillwater" line manufactured by Scientific Anglers. This is a clear monofilament line that has a sink rate slightly faster than slow sinking lines. The Stillwater line is virtually invisible to fish and is a good choice when fishing very clear waters. An added bonus of this line is its ease of casting. Once wet, the monofilament line stays lubricated and has noticeably less friction when passing through the rod guides. I prefer to use this line when fishing the deeper parts of the shoal of the lake. These lines sink at rates between 3 and 5 inches/second depending on the line weight. They are ideal lines to fish parallel to, and over the edge of drop-offs. Drop-offs are best described as that zone of the lake where the shallow shoal water rapidly deepens and you can no longer see the bottom of the lake. Drop-offs are ideal habitat for trout for several reasons. First, the deeper water at the base of the drop-off is cooler than at the surface, which is critical during warmer summer months. Secondly, most drop-off areas are still under the influence of photosynthesis so plant growth is still abundant which means good insect/invertebrate habitat and thus fish food. Thirdly, the deeper the water along the drop-off provides better protection to fish from the predators. Typical drop-off water is 6 to 8 metres deep thus making the use of faster sinking lines practical. Common trout food sources that inhabit the vegetation covering the drop-off include shrimp , dragonfly nymphs and leeches . To ensure your fly is being retrieved as close to the lake bottom as possible do a simple calculation of how long it will take the fly line to sink to the lake bottom in the depth you are anchored in. Every sinking fly line will have the sinking rate identified on the packaging. For instance, if you were anchored in 6 metres (20 feet) of water and using the extra- fast sinking line that sank at a rate of 4 inches/second, if would take 60 seconds for that line to reach the bottom. If you continually snag bottom vegetation reduce the amount of time you wait before beginning the retrieve. These 4 basic fly lines will allow you to effectively cover all the insect hatches and other invertebrates that are important trout food in lakes. A good understanding of the life cycles and habitat preference of these food sources will allow you to choose the right fly line for the hatch you are encountering that day.